70 years ago on this day, a flash above Hiroshima silenced a hundred thousand voices and heralded the beginning of a new Faustian relationship between man and his machines. But one man had seen the flash 12 years before at a traffic light in London. Here's an account of my minor pilgrimage to that traffic light and a rumination on the enduring legacy of physicist Leo Szilard on the occasion of the 70th anniversary of the atomic bombing of Hiroshima. A few years ago I made a research-related trip to London. While making headway on a collaboration to discover new anticancer drugs was the stated purpose of the trip, my other key goal was to simply stand at a particular traffic light near the British Museum in Bloomsbury and take a photo of myself standing there. I was so drawn to this mundane everyday object that I had made up my mind to visit London at least once in my lifetime for the sole purpose of standing at the intersection. What was so special about this traffic light? The answer had to do with Leo Szilard. 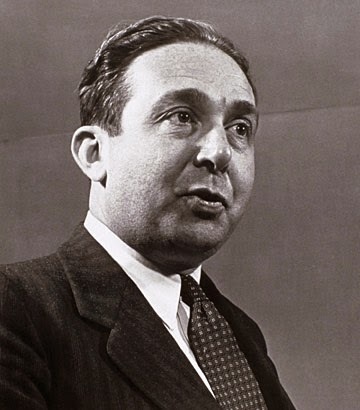 Leo Szilard – peripatetic Hungarian genius, impetuous habitué of hotel lobbies, soothsayer without peer among scientists – stands as a unique signpost at the intersection of twentieth century science and politics. Among his fellow scientists he was the great prophet who anticipated both the advent of Nazism and the coming of the nuclear arms race. To the few members of the public who are familiar with his name, he is perhaps best known as the man who persuaded Albert Einstein in July 1939 to send the famous letter to President Franklin Roosevelt warning the president of the consequences of nuclear fission which had been discovered eight months earlier in Germany. Szilard’s role in the Einstein letter was entirely consistent with his predilection for prediction. Part of the group of brilliant Hungarian “Martians” – scientists like John von Neumann and Edward Teller whose intellects and achievements were considered almost preternatural – Szilard was the most perspicacious in anticipating world events, and the most politically savvy. Even as a student in Berlin, where he hobnobbed with the likes of Einstein, Max Planck and Max von Laue, Szilard was convinced that Europe would soon go to war and that world government was the only solution to our collective problems; this conviction was only strengthened after the atomic bombings of Hiroshima and Nagasaki. Partly by accident and partly by design, Szilard played a key role in some of the most important scientific events of the twentieth century. He always saw key world events before anyone else, and planned accordingly. Born at the turn of the century to a well-off civil engineer and his wife, Szilard’s background prepared him well for anticipating consequential events. Steeped in languages and showing precocious talent for mathematics at an early age, he also became mindful of changing political fortunes after a succession of communist and fascist regimes took over Hungary after the fall of the Austro-Hungarian Empire in 1919. Like so many of his fellow scientists he left Hungary for Germany whose scientists were heralding new horizons in physics. It was German scientists like Planck and Einstein who, within a span of only twenty years, had fomented both the quantum and the relativity revolutions. In Berlin Szilard befriended Einstein and later filed a patent for a safe refrigerator with the technically savvy former patent clerk. Filing patents became a Szilard trademark; in fact his penchant for exploiting the commercial benefits of his ideas through would have made Szilard feel at home in the twenty-first century world of venture capitalism. Predating Claude Shannon by forty years, he also made important contributions to what we now call information theory. Politically Szilard could see that the country was a mess; while the 1920s Berlin of Christopher Isherwood’s “Goodbye to Berlin” (later turned into the musical "Cabaret") gleamed with dizzying decadence, unprecedented inflation, political instability and social discontent had brought people to their knees and were encouraging the slow but steady rise of fascist elements, ingredients which were congealing into a recipe for a major disaster. It was clear to Szilard, even in the 1920s, that the short-term future for Europe was dismal. He soon started living out of a suitcase, a habit that was certainly prudent and prescient for a Jewish intellectual in 1930s Germany. Acutely aware of the fate of colleagues who had been driven out of their jobs, he became active in a British committee which was helping expelled Jewish scientists secure employment. A man who was averse throughout his life to stable, salaried jobs that would deny him the pleasure of travel and squelch his free-thinking spirit, Szilard spent his time taking long walks and hounding the delis of European capitals in search of his beloved pastrami. 1933 found him living in London on a modest budget, subsisting on money earned from patents and private physics lessons. It was during one of his walks that Szilard had an epiphany that would gain him a place in the history books and, six decades later, compel a callow student of the history of science to seek out a traffic light in London. Adolf Hitler had come to power in January, The Depression was raging and the future looked bleak to many. On the morning of September 12, 1933, on a miserable, wet English autumn day, at the intersection where Russell Square meets Southampton Row, Szilard waited impatiently at a traffic light waiting for it to change from red to green. He had just been sitting in a cafe, reading an article in The Times reporting a lecture by the great English physicist Ernest Rutherford. Rutherford, known to many as the father of nuclear physics, was discussing the newly prophesied release of energy from atoms, most notably by science-fiction pioneer H G Wells in his book “The World Set Free” which Szilard had recently read. It had been only one year when a Rutherford protégé named James Chadwick had discovered the elusive neutron, the third component of the nuclear atom along with electrons and protons. The past few years had seen a succession of experiments designed to shoot various particles into the heart of the atomic nucleus to probe its structure. Since every one of these particles had been charged they had to contend with the fearsome charged barrier erected by protons and electrons; lacking charge, the neutron was considered an ideal candidate as an atomic projectile. The science of nuclear physics was then in its heyday, as were social strife and the rise of fascism. Wells was not averse to speculating on a potentially explosive meld of the two. In his book the great powers of the world wage war with what Wells calls “atomic bombs”, gadgets deriving their enormous stores of energy from the forces holding the atomic nucleus together. Wells’s prognostications as well as Rutherford’s response to it had both made the front page of The Times. When asked whether there was any realistic chance of harnessing energy from the atom, Rutherford in his baritone voice dismissed this fanciful idea as nonsense. Any thought of releasing the energy locked inside the nucleus, he said, was “moonshine”. What happened next has been immortalized by historian Richard Rhodes in his seminal work, “The Making of the Atomic Bomb”. The first time I read about it the words got seared into my mind. Time cracked open indeed. What Szilard realized as he stepped off that curb was that if we found an element that when bombarded by one neutron would release two neutrons, it could lead to a chain reaction that could possibly release vast amounts of energy. Leo Szilard had discovered the nuclear chain reaction long before anyone else, six years before the discovery of nuclear fission and any inkling that anyone could have had about the release of atomic energy, let alone the woeful apocalyptic future that would await the world because of its release. In his later days Szilard told an audience, “Physics and politics were always my two great interests”. That September morning the two unexpectedly collided at the traffic intersection and foretold a chain reaction of world events. I first read Rhodes’s book in college; it was one of the books that sealed my resolve to become a scientist. The book begins with this story. Since then the event has been etched in my mind like words in red-hot steel. The description is so riveting, the tale so profound and evocative, the person so singular and the implications so prophetic, that I resolved to visit Szilard’s traffic light even if I had to once make a trip to London for just this purpose. Several years later I had the opportunity. The traffic light itself is completely nondescript, standing among dozens of other nondescript lights. My friend and I almost missed it. As I mused aloud about my great disappointment in a cafe and wished I had a map, a Spanish tourist sitting at the next table saved my life and procured one. The intersection was there; we had missed it by a block. Back we went and indeed there it was, with not an indication that a famous and prophetic physicist had seen into the future at that light some 75 years ago. I stood at the intersection and had my friend take a photo for posterity. A moment captured in time, in homage to another moment prophesying the possible end of time. As it happened, Szilard’s choice for the element he was thinking about turned out to be wrong. He dutifully filed a patent about his idea with the British Admiralty, which promptly stashed it away in the dark as the fanciful meanderings of an eccentric scientist. In fact nuclear fission would be discovered only six years later in Germany after a series of close misses in Italy and France. When Otto Hahn and Fritz Strassman reported the unexpected breaking up of the uranium nucleus, it was Szilard’s vision on that wet English day that allowed him to grasp the significance of the discovery instantly and prompted him to persuade Einstein to send his famous letter to FDR. He would go on to work with Enrico Fermi on the world’s first nuclear reactor, exasperate Manhattan Project security with his contempt for compartmentalization and unsuccessfully try to get another letter to FDR - this time presciently warning that direct use of the bomb would spark an arms race - before a stroke unexpectedly cut the president’s life short. Ironically when the first atomic bomb test was conducted on July 16, 1945 in the deathly stillness of the New Mexico desert, the flash was so bright that it would have been seen reflected off the moon. It was, literally, “moonshine”. The rest was history. Leo Szilard died peacefully in his sleep in 1964, hoping that the genie he and his fellow scientists had unleashed would co-exist harmoniously with mankind. But that day I lived one of my minor dreams at that traffic light in London. A light illuminating a tale of human triumph and folly. Leo Szilard’s light. Standing at the intersection, I could not help but feel my mind racing across gulfs of time and forging a connection with this remarkable man. I stood there in silence for a few minutes, contemplating the consequences of Szilard’s vision for the future. Then we went on our way. A light rain began to batter the sidewalk. 2. Richard Rhodes - The Making of the Atomic Bomb (this remains the most eloquent and definitive history of the birth of the atomic age). The intersection of Russell Square and Southampton Row where I stood. Of course, it's probably impossible to say which of the four lights Szilard was standing at (I was at the one to the right myself). Jacob Bronowski, who claims to have known Szilard, relates the same story in his book, The Ascent of Man. Bronowski finds one part of the story improbable as, "I never knew Szilard to stop for a red light.". That would not have been atypical of Szilard! I am currently reading Teller's Energy From Heaven and Earth and I learned a few new things (for me) about Szilard. I'd like to share them here. - Szilard goes and tries to explain Rutherford that the energy of nuclei can in fact be used, but Rutherford throws him out of his office. Just missed this by a block when I last visited the British Museum! That's the good (or bad) thing about London - everywhere you turn is some site that's loaded with (perhaps secret) history. Indeed! It's pretty amazing how much scientific history can be found in nooks and crannies of these places if you only knew where to look. An interesting book along these lines is "The Physical Tourist"
Will CADD ever become relevant to drug discovery? Chemistry is not harder than other sciences...just different.